Originally published in the East Bay Express on Feb. 24. 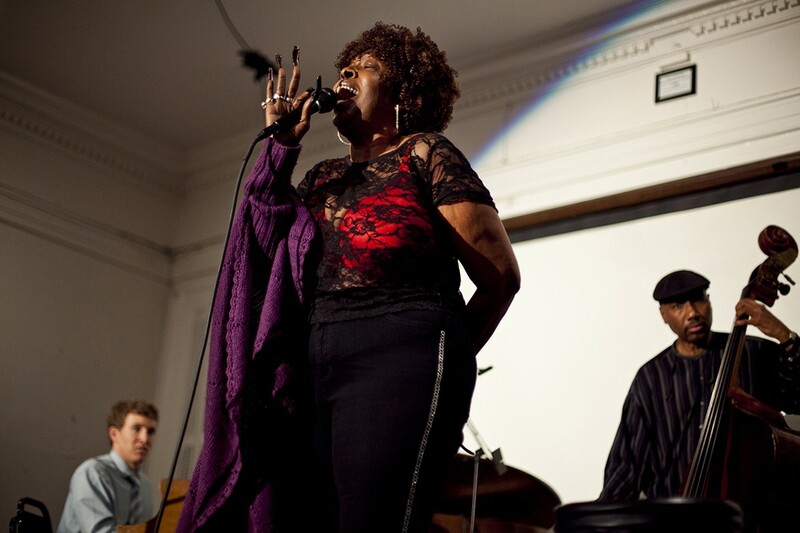 Faye Carol sang during a fundraising benefit last week at Geoffrey’s Inner Circle. Photo by Erin Baldassari/East Bay Express. Known as much today for its gritty DIY spaces as its elegant performances venues, the East Bay’s entertainment scene has always catered to an eclectic array of tastes. But take a look at the music and entertainment venues that have stood the test of time, and you’ll find radical and inclusive spaces — from the area’s days as the West Coast hub of blues music to its pioneering gay and lesbian bars — that continue to serve up quality music, even as music trends change. Geoffrey’s Inner Circle (410 14th St., Oakland). Hailed as the Harlem of the West Coast, Oakland’s 7th Street corridor was once a crowded strip of blues and jazz joints serving the city’s burgeoning African-American population, many of whom worked at the then-Oakland Army Base or the port. Those venues were all wiped out through eminent domain takeovers and redevelopment, but Geoffrey’s Inner Circle carries on the tradition as a Black-owned and operated venue that delivers blues and jazz music on a regular basis. Owner Geoffrey Peete turned an all-white men’s club established in 1883 into the music and cultural institution it is today. Go there on a Monday night to check out Calvin Keys’ weekly jazz jam, a veritable who’s who of local legends and emerging talent. Everett & Jones (126 Broadway, Oakland). Dorothy Everett, her eight daughters, son, and son-in-law opened their first take-out barbecue restaurant on 92nd Avenue in Oakland in 1973 and quickly expanded to six locations in as many years. When the family opened its first sit-down restaurant in the Jack London district seventeen years ago, it began offering R&B, jazz, and blues music every Friday and Saturday night, said co-owner Dorothy King. Ronnie Stewart, a local blues luminary and founder of the Bay Area Blues Society, now hosts the regular Saturday night blues show, King said. White Horse Inn (6551 Telegraph Ave., Oakland). The White Horse, which opened in 1933, claims to be the oldest continuously operating gay and lesbian bar in the United States. Though it’s unclear just how the White Horse became a gay watering hole, longtime patrons say it was known as such (in certain circles) since at least the early Forties. Today, the bar continues to be a beacon for LGBT rights activism. Its bi-monthly drag king showcase, called Rebel Kings, is renowned in the Bay Area, and the bar regularly draws some of the best DJs in town. Starry Plough (3101 Shattuck Ave., Berkeley). Originally established in 1973 by a group of anti-imperialist and anti-capitalist Irish political activists, the Starry Plough was essentially a source of funding to support the ouster of the British government from Ireland, said Shahin Naima, whose parents have owned the bar since 1985. Over the years, the activist group took on other anti-imperialist causes, evidence of which still adorns the bar’s walls. The bar continues to host Irish music and dancing but has since added other live music acts, plus it’s home to the longest-running poetry slam in Northern California, held every Wednesday. Freight & Salvage Coffeehouse (2020 Addison St., Berkeley). With 1960s flower power folk music giving way to 1970s psychedelic rock, Nancy Owens wanted to keep traditional American roots music alive, said Freight executive director Sharon Dolan. So Owens purchased an old furniture store on San Pablo Avenue in Berkeley in 1968, transforming it into a performance venue and cafe, Dolan said. The coffeehouse has changed locations twice since that time and has more than quadrupled in size. But, staying true to its community ethos, the venue now operates as a nonprofit and holds classes in a variety of instruments and musical styles. Ashkenaz (1317 San Pablo Ave., Berkeley). David Nadel, a dedicated human rights activist, believed adamantly in the power of cultural exchange to transform lives, according to Ashkenaz executive director Brandi Brandes. In 1973, he began holding folk dance classes in a small corner of a warehouse on San Pablo Avenue in Berkeley and hosting musicians from diverse backgrounds, including classical Indian, Flamenco, reggae, and Eastern European traditions. The success of those concerts and classes allowed Nadel to ultimately purchase the building. In 1996, a drunk man, who Nadel refused to allow back into the bar, shot him in the head, killing him. Community members formed a nonprofit to keep the venue running and continue to operate it today, honoring his legacy of using music and dance as a tool to promote peace.